View of a canal of Amsterdam. Amsterdam, capital of the Netherlands, has more than one hundred kilometers of grachten (canals), about 90 islands and 1,500 bridges. The three main canals (Herengracht, Prinsengracht and Keizersgracht), dug in the 17th century during the Dutch Golden Age, form concentric belts around the city, known as the Grachtengordel. Alongside the main canals are 1550 monumental buildings. 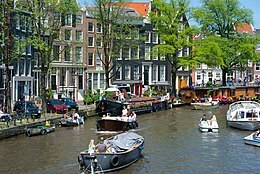 The 17th-century canal ring area, including the Prinsengracht, Keizersgracht, Herengracht and Jordaan, were listed as UNESCO World Heritage Site in 2010, contributing to Amsterdam's fame as the "Venice of the North". Much of the Amsterdam canal system is the successful outcome of city planning. In the early part of the 17th century, with immigration rising, a comprehensive plan was put together, calling for four main, concentric half-circles of canals with their ends resting on the IJ Bay. Known as the "grachtengordel", three of the canals are mostly for residential development (Herengracht or ‘’Patricians' Canal’’; Keizersgracht or ‘’Emperor's Canal’’; and Prinsengracht or ‘’Prince's Canal’’), and a fourth, outer canal, the Singelgracht, for purposes of defense and water management. The plan also envisaged interconnecting canals along radii; a set of parallel canals in the Jordaan quarter (primarily for the transportation of goods, for example, beer); the conversion of an existing, inner perimeter canal (Singel) from a defensive purpose to residential and commercial development; and more than one hundred bridges. The defensive purpose of the Nassau/Stadhouderskade was served by moat and earthen dikes, with gates at transit points but otherwise no masonry superstructures. Construction proceeded from west to east, across the breadth of the layout, like a gigantic windshield wiper as the historian Geert Mak calls it – not from the center outwards as a popular myth has it. Construction of the north-western sector was started in 1613 and was finished around 1625. After 1664, building in the southern sector was started, although slowly because of an economic depression.[which?] The eastern part of the concentric canal plan, covering the area between the Amstel river and the IJ Bay, was not implemented for a long time. In the following centuries, the land went mostly for park, the Botanical garden, old age homes, theaters and other public facilities – and for waterways without much plan. 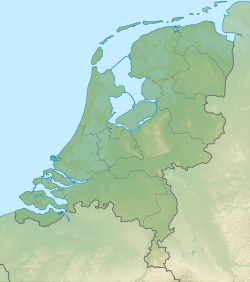 Several parts of the city and of the urban area are polders, recognizable by their postfix -meer meaning 'lake', such as Aalsmeer, Bijlmermeer, Haarlemmermeer, and Watergraafsmeer. The canals in Amsterdam are now used for tourism, recreation, house boats, and a relatively small amount of private transport compared to the main modes of walking, light rail, subway, and bicycle. Most of the canals are paralleled by automobile roads on both sides. A map showing Amsterdam with its canals from 1662 CE. View of the Westerkerk, c. 1660 CE. Amsterdam's canal, second half of 17th century. View of Oudezijds Voorburgwal, c. 1670 CE. View of the Herengracht, c. 1670 CE. The Martelaarsgracht, c. 1670 CE. The Golden Bend, 1685 CE. Nieuwezijds Voorburgwal, c. 1686 CE. Singel encircled the medieval city of Amsterdam. It served as a moat around the city from 1480 until 1585, when Amsterdam expanded beyond Singel. 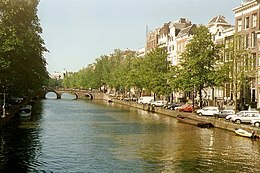 The canal runs from the IJ Bay, near Central Station, to the Muntplein square, where it meets the Amstel river. It is now the inner-most canal in Amsterdam's semicircular ring of canals. The canal should not be confused with Singelgracht canal, which became the outer limit of the city during the Dutch Golden Age in the 17th Century. 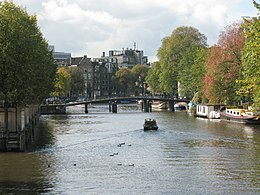 Herengracht (Patricians' Canal or Lords' Canal) is the first of the three major canals in the city centre of Amsterdam. The canal is named after the heren regeerders who governed the city in the 16th and 17th century. The most fashionable part is called the Golden Bend, with many double wide mansions, inner gardens and coach houses on Keizersgracht. Samuel Sarphati (1813-1868) lived at the house at number 598 and Peter the Great stayed at the house at number 527 during his second visit to Amsterdam. Keizersgracht (literal English translation: Emperor's Canal) is the second and widest of the three major canals in the city centre of Amsterdam, in between Herengracht and Prinsengracht. It is named after Maximilian I, Holy Roman Emperor. [unreliable source?] John Adams stayed at the house at number 529, Heinrich Schliemann worked for almost three years at number 71, Daniel Fahrenheit at 463-465, and during his first visit to Amsterdam (1693), Peter the Great stayed at the house at number 317. The Homomonument (Gay Monument) faces the Keizersgracht. Prinsengracht (Prince's Canal) is the fourth and the longest of the main canals in Amsterdam. It is named after the Prince of Orange. Most of the canal houses along it were built during the Dutch Golden Age of the United Provinces. The bridges over the Prinsengracht canal connect with the streets in the Jordaan. Notable buildings along Prinsengracht include the Noorderkerk (Northern Church), the Noordermarkt (Northern Market), Anne Frank House, and the Westerkerk (Western Church, Amsterdam's tallest church). Annually, the Prinsengrachtconcert is held on a pontoon in the canal in front of Hotel Pulitzer. Zwanenburgwal is a canal and street in the center of Amsterdam. The painter Rembrandt and philosopher Spinoza lived here. 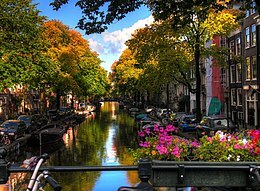 In 2006 it was voted one of the most beautiful streets in Amsterdam by readers of Het Parool, a local daily newspaper. Zwanenburgwal flows from Sint Antoniessluis sluice gate (between the streets Sint Antoniesbreestraat and Jodenbreestraat) to the Amstel river. The canal was originally named Verversgracht ("dyers' canal"), after the textile industry that once dominated this part of town. Dyed textiles were hung to dry along the canal. Brouwersgracht is a canal in the city centre of Amsterdam and is part of the canal belt connecting the Singel, Herengracht, Keizergracht and Prinsengracht and marks the northern border of the canal belt. The canal served as a site for ships returning from Asia with spices and silks, therefore Brouwersgracht had many warehouses and storage depots for the ships inventories. Likewise some officials of the Dutch East India Company lived here such as their cartographer (1708-1743) Isaak de Graaf. Breweries were also prevalent in the area due to the access to fresh water shipments. Today the warehouses are now apartments, some of the most expensive in Amsterdam. Houseboats also are seen in the canal. In 2007, Brouwersgracht was voted the most beautiful street in Amsterdam by readers of Het Parool, a national daily newspaper. Kloveniersburgwal is a canal running south from Nieuwmarkt to the Amstel River on the edge of the medieval city. The east side became populated in the 17th century and has a few grand mansions, like the Trippenhuis, now housing the Royal Netherlands Academy of Arts and Sciences (KNAW). Kloveniersburgwal was popular with administrators at the Dutch East India Company, being close to its nerve center on Oude Hoogstraat and its warehouse. These four canals are the newest in Amsterdam, constructed on Java Island in 1995, a manmade island in the IJ Harbor, north-east of the City Center. The canals are lined with modern interpretations of classic Amsterdam canal houses, which were designed by 19 young Dutch architects. Each house is 4.5 meters wide and 4 or 5 stories tall, but the designs are totally unique and are often featured in Amsterdam travel guides despite being off the beaten path of most tourists. Nine ornate metal bridges, designed by artist couple Guy Rombouts and Monika Droste, cross the canals for pedestrians and cyclists. ^ "Monumenten Amsterdam". Monumenten en Archeologie Amsterdam. City of Amsterdam. Archived from the original on 2008-02-08. Retrieved 2008-02-22. ^ "Seventeenth-century canal ring area of Amsterdam inside the Singelgracht - UNESCO World Heritage Centre". Whc.unesco.org. Retrieved 2012-01-31. ^ "Amsterdamhotspots.nl". Archived from the original on 2007-04-04. Retrieved 2007-04-19. 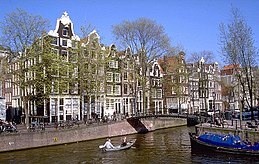 ^ "World Executive City Guides - Amsterdam". Retrieved 2007-04-19. ^ "Grachtengordel". Jlgrealestate.com. Retrieved 2012-01-31. ^ Taverne, E. R. M. (1978). In ‘t land van belofte, in de nieue stadt: ideaal en werkelijkheid van de stadsuitleg in de Republiek, 1580-1680 (In the land of promise, in the new city: ideal and reality of the city lay-out in the [Dutch] Republic, 1580-1680). Maarssen: Schwartz. ISBN 90-6179-024-7. ^ Mak, G. (1995). Een kleine geschiedenis van Amsterdam. 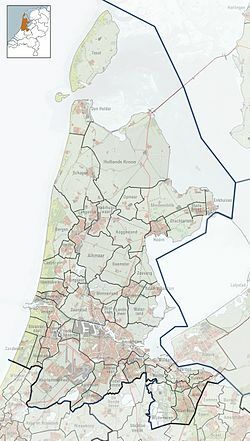 Amsterdam/Antwerp: Uitgeverij Atlas. ISBN 90-450-1232-4. ^ "Monumenten Amsterdam". Monumenten en Archeologie Amsterdam. City of Amsterdam. Archived from the original on 2007-04-07. Retrieved 2007-04-15. ^ "Noordermarkt - Best Saturday Market - That Dam Guide". That Dam Guide. 2013-05-30. Retrieved 2016-12-15. ^ "Anne Frank House in Amsterdam | Amsterdam.info". www.amsterdam.info. Retrieved 2016-12-15. ^ "Anne Frank House". www.iamsterdam.com. Retrieved 2016-12-15. ^ "Westerkerk in Amsterdam | Amsterdam.info". www.amsterdam.info. Retrieved 2016-12-15. ^ "Prinsengracht Concert". www.iamsterdam.com. Retrieved 2016-12-15. ^ Martin Dunford (2010). The Rough Guide to The Netherlands. Penguin. p. 71. ISBN 978-1-84836-882-8. 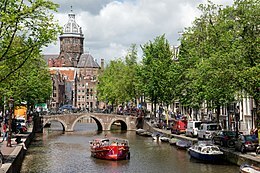 ^ "Holland.com: History of the canals in Holland". www.holland.com. Retrieved 2017-09-27.